There. I said it. I'm calling it. Where others tread gingerly around this topic, I'm going out on a limb -- we're in a technology bubble. How come so few will say it? It's kinda like cleverly called oneself, "The Artist Formerly Known as Prince." If it looks like a bubble, feels like a bubble, and pops like a bubble, isn't it so? 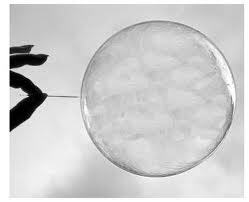 The good news is that the bubble is still inflating. Sure, there are a few hissing sounds and maybe that's good. These are the warning signs. And, there are some sane voices out there with a good perspective on things. Listen carefully and act: You still have time to take when the taking is good. Listen to these people. And, to put things in perspective, this bubble still is far cry from the bubble of yesteryear. Will it pop? Or will it quietly deflate and we won't suffer the consequences of a traumatic downturn? And then, all most by definition, it won't be a bubble after all. Key dates to watch: August 3 if we can't get this debt limit thing worked out. And January 23, 2013 -- after the elections. In the mean time, it feels like 1999. Keep partying. But, remember to take something off the table too. And save for a rainy day.